Veteran Vietnamese bodybuilder Pham Van Mach won a gold medal at the ongoing World Bodybuilding and Physique Sports Championships in Ulaanbaatar, Mongolia. 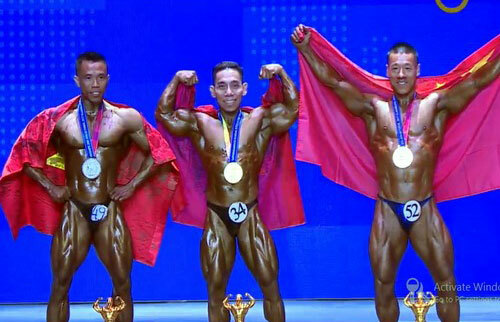 Mach from the southern province of An Giang finished first in the men’s 55kg bodybuilding event. His teammate Khanh Khuong came second and Chinese Shao Liu-xin was third. It is the fifth time that Mach, who just returned to bodybuilding a few months ago after nearly two years working as a singer and dancer in HCM City, triumphed at a world tournament. In the men’s 65kg class, Tran Hoang Duy Phuc from HCM City won a bronze medal while his former world champion teammate Nguyen Anh Thong from Can Tho City finished fourth in the men’s 60kg. In the coming days, Vietnam will compete in the other events with title favourites such as Lam Van Cuol, Nguyen Van Kien, Dinh Kim Loan and Tran Thi Cam Tu. The tournament runs from October 3-9, held for the first time in Mongolia. The ninth edition of the event has lured about 500 athletes from more than 60 countries in 39 categories./.